Of 500 eager applicants, only 100 secure a highly-coveted space in the National Youth Orchestra (NYO) of Canada each year. This summer, Don Wright Faculty of Music string students Anna Grigg, Darren Mak, Dorothy Lin, Christian Wrona and Jillian Yang will join the esteemed orchestra, partaking in a summer institute and pan-Canadian tour in July and August in honour of Canada’s 150th anniversary. 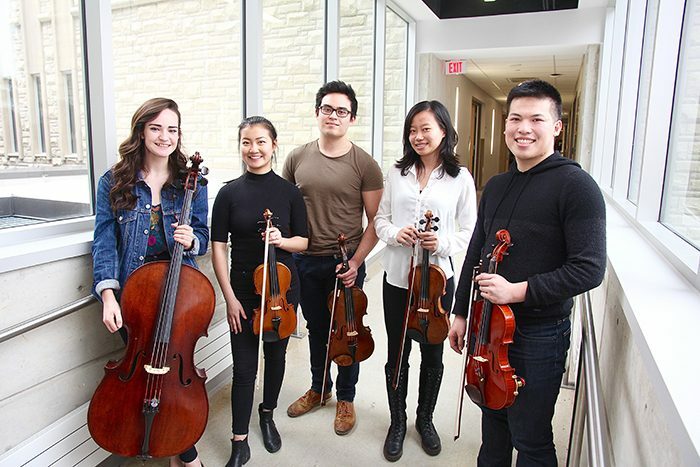 Paul Mayne // Western NewsDon Wright Faculty of Music Students Anna Grigg, Dorothy Lin, Christian Wrona, Jillian Yang and Darren Mak have secured a highly-coveted spot on the National Youth Orchestra of Canada this summer. The orchestra will perform specially-commissioned works in 11 cities across Canada in July and August in honour of Canada’s 150th anniversary. The NYO of Canada was one of just 40 organizations hand-picked to design, lead and execute a signature event in honour of Canada’s sesquicentennial. For the 2017 Edges of Canada Tour, the orchestra will perform specially-commissioned works in 11 cities across Canada and will join hands with some of Canada’s Indigenous artists for a youth-oriented response to The Truth and Reconciliation Commission. “NYO is a pretty highly esteemed summer program throughout Canada. There’s a surprising number of professional orchestra players in Canada who have done the program,” said third-year Music Performance student Grigg, who plays the cello. She is thrilled to be a part of the tour. “I’m mostly excited to travel and make connections with musicians I may not have been able to by myself. I would have never been able to travel to Whitehorse, for example, so it’s cool we get to meet so many people and make connections across Canada,” she added. According to the NYO of Canada website, 40 per cent of Canadian professional orchestra players are alumni of the program. Grigg, whose sisters play violin and whose mother is a professional pianist, hopes one day to be among this esteemed lot. “First, I want to do more education in the music world. I definitely want to get a Master’s, but, after that, it’s really whatever comes my way. As long as I’m able to have a career performing, I’ll be happy. If it’s in an orchestra, chamber group, solo, if I teach,” she said. The Edges of Canada Tour kicks off in Ottawa on July 22 and zig zags across the country, culminating in a performance in Vancouver on Aug. 15. For more information about the orchestra and tour, visit nyoc.org/2017tour. To hear Western Music students and faculty members play, take in one of the many free events offered to the general public. For more information, visit: music.uwo.ca/events.